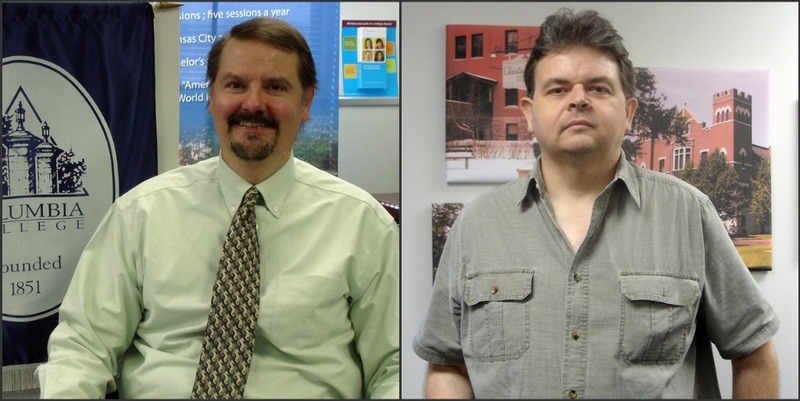 Two Columbia College–Kansas City faculty members received service awards: Timothy Hamilton and Dr. Chris Mosley. Timothy Hamilton, who teaches economics and business law, received the 10-Year Service Award. Hamilton earned his Juris Doctorate from the University of Kansas School of Law, and he worked as an attorney at law for 17 years. In 2009, he was a presenter for the Missouri Valley Economic Association with his paper titled, “The Creation of a New Healthcare Currency and National Health Bank to Achieve Pareto Efficiency in Healthcare Markets for the United State of America,” and a discussant for the paper, “Do Health Care Costs or State Policy Affect State Self-Employment Rates?” Hamilton is a member of the Westgate Masonic Lodge and a lifetime member of Phi Kappa Phi Honor Society. His e-book “Good Grades in No Time: Ten Minute Tips That Guarantee College Success” is available on Amazon Kindle. Dr. Chris Mosley received the 5-Year Service Award. Mosley teaches mathematics and astronomy at the Kansas City campus. He earned his Doctor of Philosophy in Physics from Union Institute and University in Cincinnati, and he has taught for University of Missouri-Kansas City, Kansas City Kansas Community College and Metropolitan Community College, among others. In 1991, Mosley received the Independent Study and Research Award for the successful study and development of Electronic Power Supply, and the John E. Davis Sigma Pi Sigma Award for the physics major making greatest achievement in General Physics. He is a member of Sigma Pi Sigma Honor Society. Mosley’s article titled, “Observations of 134 keV ot .6 MeV, Z > 2 Nuclei in the 32 to 91 AU Heliorandius Range with Voyagers 1 & 2,” was published in the Journal of Geophysical Research.